Why are we stopping? Let's go, go, go! First one to the house gets an extra treat! Bring on the yummy stuff! For two days, I've come home to not two but three wagging tails...oh, the joy! You might remember our friend Lucky. He is staying with us for nearly two weeks while his Shih Tzu Mom and Dad honeymoon in Alaska. 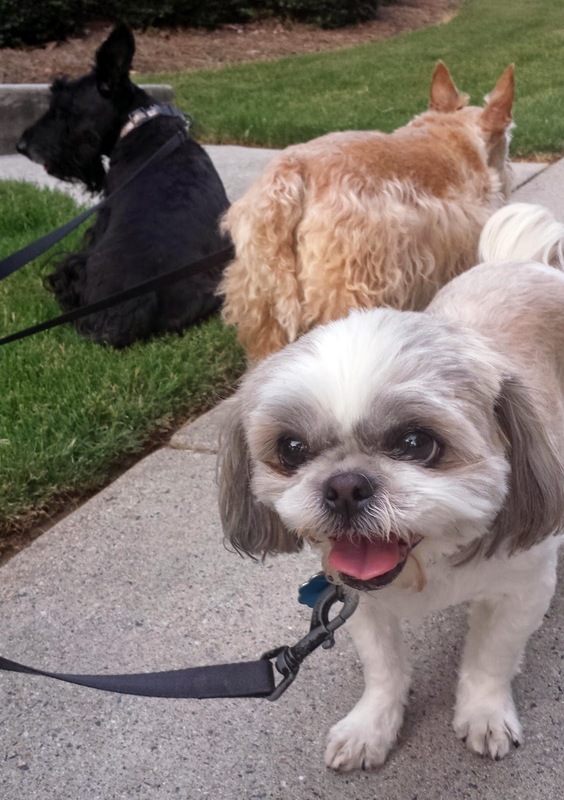 I volunteered to keep Lucky while Shih Tzu Mom and Dad were away partially because I think Lucky is so adorable, I could just eat him up - who wouldn't want to have his cute face around every day? 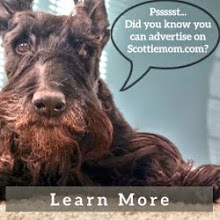 The other part of me thought this would be the perfect litmus test to see if Scottie Dad and I could handle a third (and possibly one day a fourth) rescue Scottie. 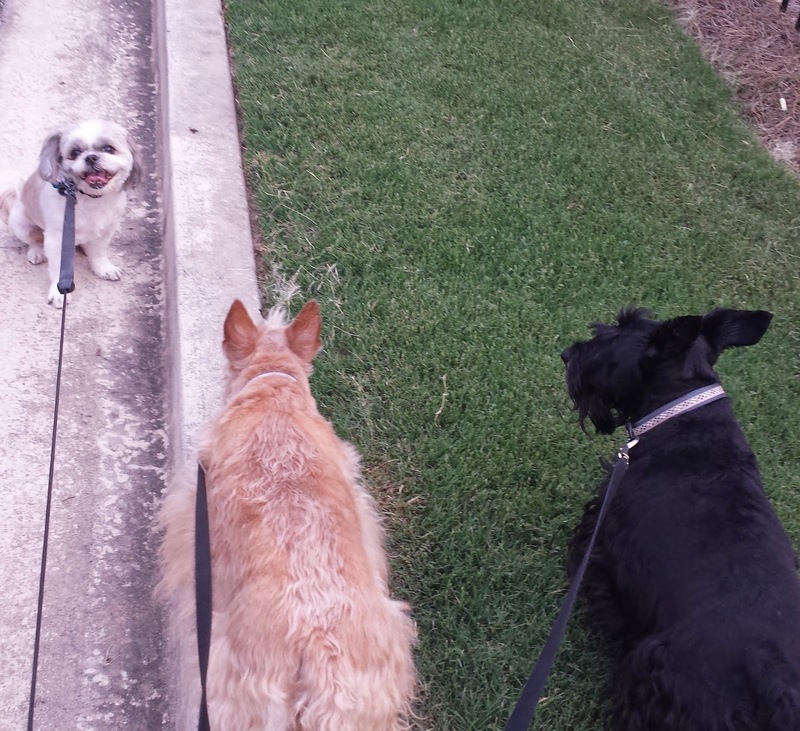 The first night, Scottie Dad took Lucky and I took the Scots on our late night walk. The following morning, I knew I'd be venturing out with the three all on my own. Could I handle it? Turns out, I totally could - so long as the dogs are behaving! Lucky, Heather and Mr. K walked about the neighborhood tending to their own business, the boys exchanging pee-mail from time to time and moving forward cohesively as a group. I've never seen anything like it. The Scots have only met Lucky a few times before this extended stay and yet, they coexist like they've known each other all along. But for now, it's all three times the tail-wagging fun! Three tails wagging to wake up to in the morning and three tails wagging to greet me after a long day at work. I'm not sure if Scottie Dad would agree just yet but I think I agree with whomever said, "Good things come in threes." 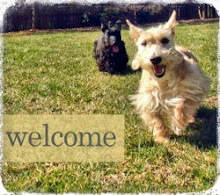 Surely, that logic can be applied when considering whether to adopt another Scottie, right? I would be jealous if the visitor had more privileges than the family. 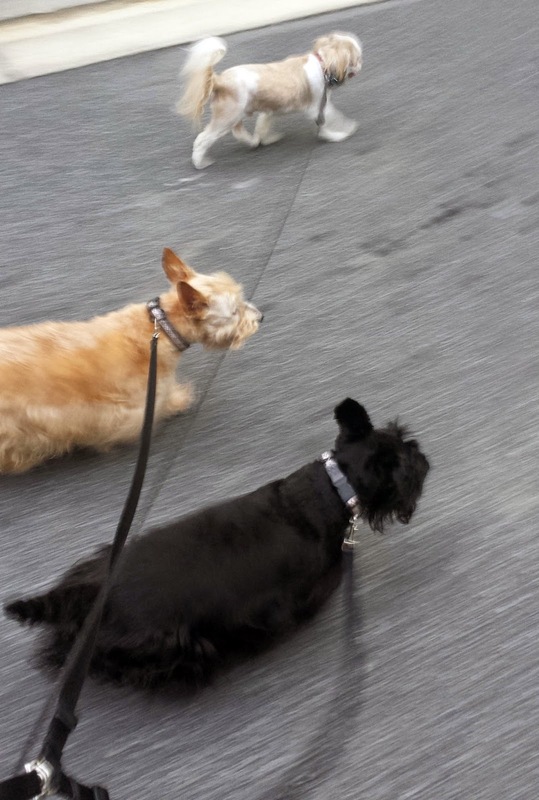 Scotties either take to another dog or they don't. I've seen it with mine. We will be having Dixie here again soon for a week. They love her and allow her to stay in the big bed with them. 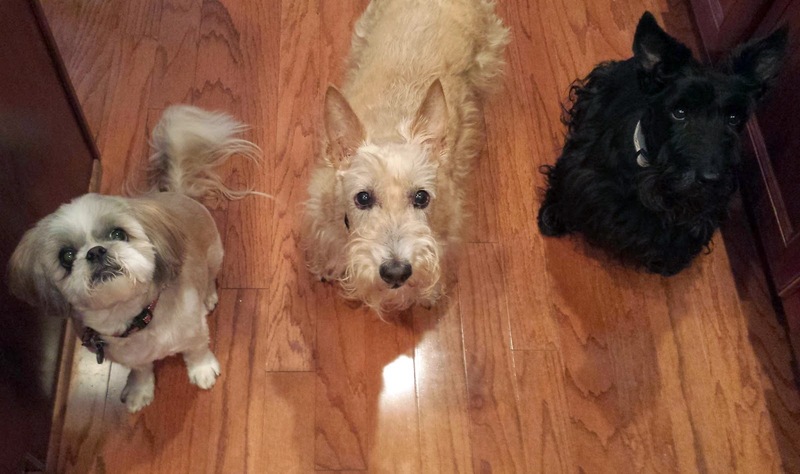 What an adorable trio :-) For a brief moment of confusion, I thought Lucky was a Pug, that I looked past the face. They look like a very happy crew.